Our Pets Stay @ Home service offers a friendly and professional pet sitting service in your own home, with daily visits, scheduled 3 times a day, during your time are away. We understand that no matter how good the kennels or cattery may be, some pets just prefer to stay at home. Our unique service will provide the stress-free exercise, diet, play and cuddles that your pet requires. We work very hard to ensure that your pet has an enjoyable time staying at home. All of our staff are trained and insured and will work with your pet’s individual needs. We can create a customized plan to make sure that your pet’s normal routine is adhered to as much as possible. 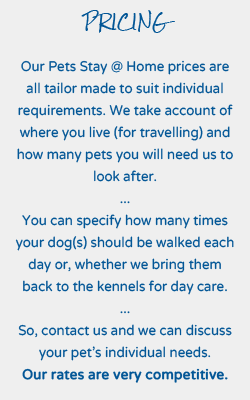 We understand that each pet is an individual and we will work with you to create a personalised plan. As we work closely with rescued and abandoned animals (please have a look at our re-homing page) we have the vital experience to deal with timid or nervy pets. We can also administer any medication that your beloved pet may need; this means that our service is very popular with the older pets, or those that are too poorly or old for the excitement of a kennels and cattery.